Preheat oven to 350 degrees F. Lightly spray/grease a 3 quart casserole dish (preferably at least 3 inches deep) and set aside. In a 6 quart stockpot, melt butter and saute celery and onion until tender; add chicken stock, carrots, green beans or broccoli; cover and simmer until vegetables are tender. Add parsley, Italian seasoning, salt and pepper to taste. Bring stock and vegetable mixture to a light boil/simmer while stirring in the xanthum gum 1/2 at a time, whisking vigorously until well blended. Sprinkle the remaining 1/2 in a little at a time, whisking briskly until the broth begins to thicken. Once it has reached the thickness you like, add the cream and stir well. If you accidentally thicken it more than you want, thin the sauce with additional broth. Check seasoning and make any necessary adjustments. Stir in 1 cup cheddar cheese until melted. Add chicken to the sauce and mix well. Simmer on low for a few minutes to just to keep hot. In a medium bowl, add all crust ingredients and cut in with a pastry/dough cutter until crumbly and all flour is moistened and cheese is pulverized into the mixture. 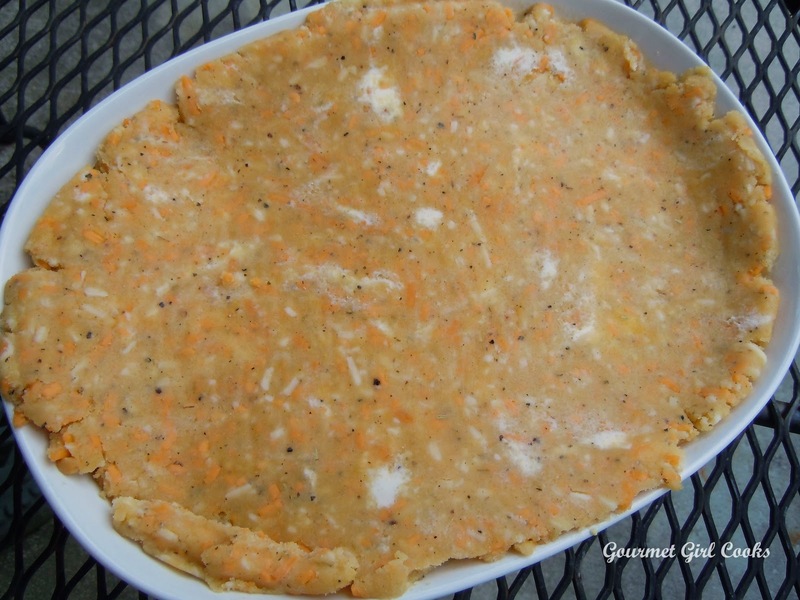 Press dough together in a ball and place on a sheet of parchment paper and flatten out lightly into a circular shape (or the shape of the top of your casserole); cover with another piece of parchment paper and roll out to about 1/4 inch thickness to the size of your casserole dish. Handle the dough minimally with your hands (you don't want to heat up or melt the butter in the dough, you want it to remain stiff). 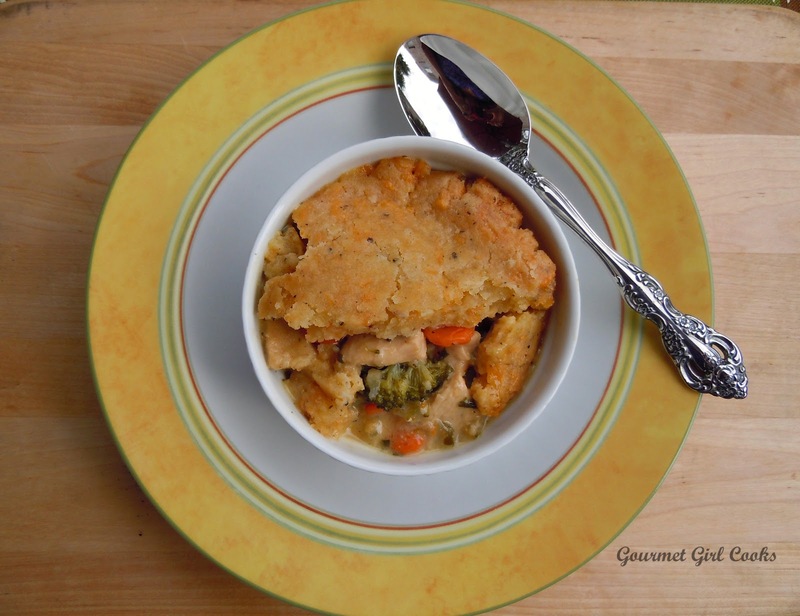 Once dough is rolled out evenly and the size of your casserole dish, it is easier to transfer to the top of your pot pie if you place the rolled crust into the freezer for about 15-20 minutes to get firm. After chilling crust, pour hot filling mixture into casserole dish. 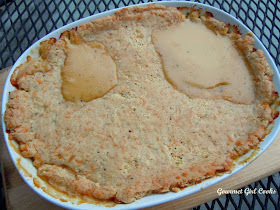 Gently and carefully lift the dough and move it on top of the filling in the casserole (it is important to choose the right size casserole so your filling will be within an inch or so of the top when filled and the crust will fit and lay nicely on top). If it cracks a little, gently press it back together. 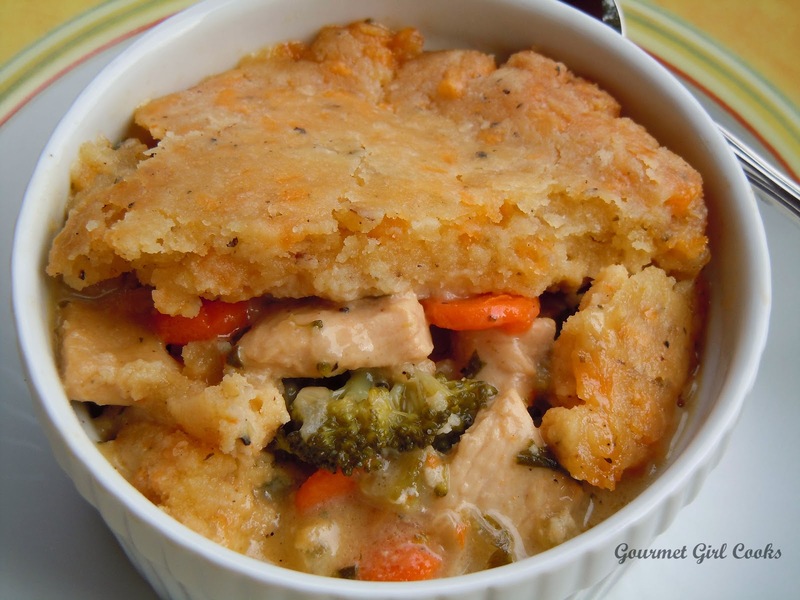 Use any leftover scraps of dough to build a crust around the edge of casserole dish. 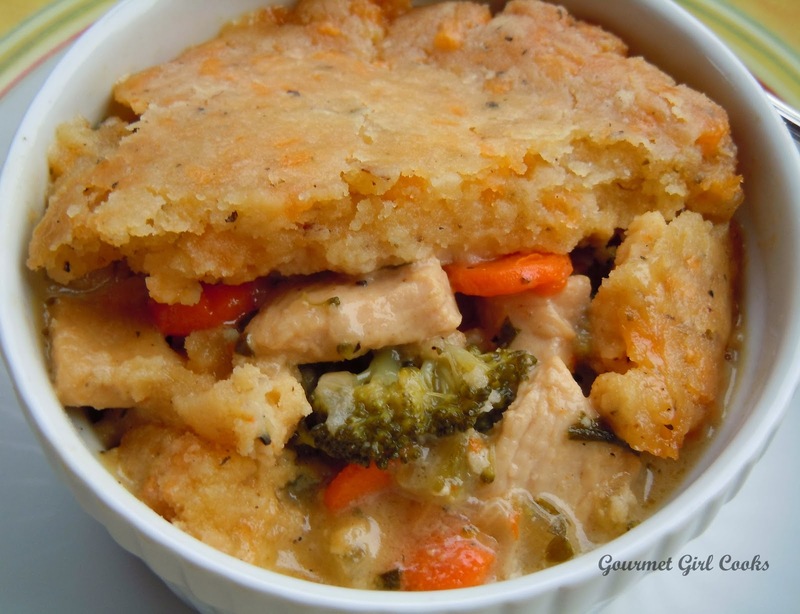 Bake chicken pot pie in a 350 degree oven for 15 minutes; lower oven temperature to 325 degrees and bake an additional 15-20 minutes until crust is golden brown and done (crust is firm to the touch when done). *Optional: If you prefer not to use xanthum gum to thicken the soup, you can substitute a few ounces of cream cheese by melting in a saucepan and stirring broth in until desired thickness. This is such a delicious recipe. I made it once before, and my husband loved it! By the way, you really deserve a commission from Costco. We just got one in our city. I signed up tonight, and they open Wednesday. I don't think I would have done it had you not shared how many wonderful, healthy foods you purchase there at such great prices. I'm excited. 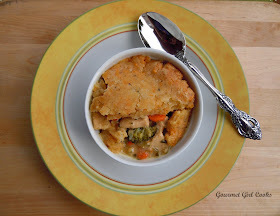 I've never been much of a fan of any kind of pot pie, but this could certainly change my opinion. 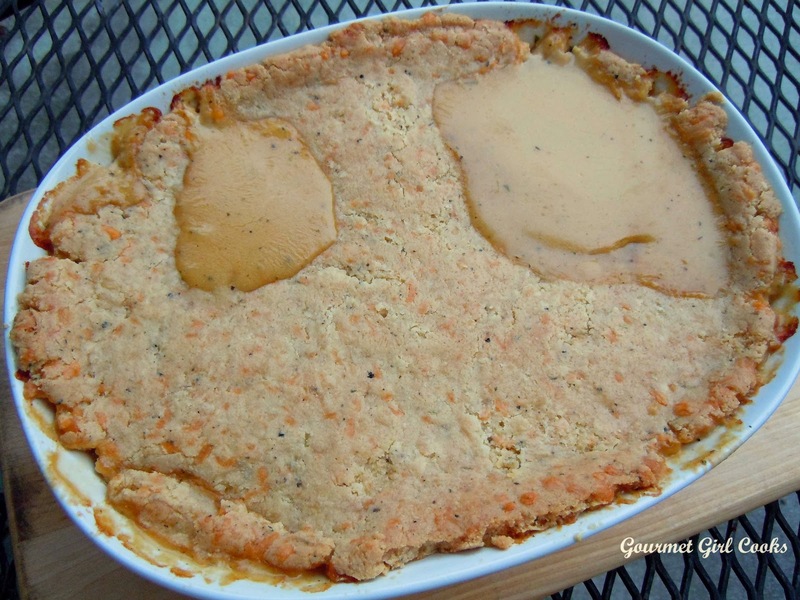 Can hardly wait to try this...Thanks so much for sharing because this is one of my favorite fall comfort dishes! This looks very good. I used to love it before wheat free days so this looks like a keeper. I made your spinach-feta pie yesterday and it is awesome. I don't care for feta so I used another cheese. I also replaced 1/4 of the flour in the crust with sunflower seed flour that I ground up. Yummy and it tastes good heated up again. Since my hubby doesn't care for spinach, I will be eating it all week. I plan to make it often.Thanks for the recipe. GGC.... I'm sooo thankful I came across ur site. Our family has changed our lifestyle eating and your site has enlarged our territory for sure!! Keeping our total carbs at a low daily, using almond/coconut flours the past 5 months and our motto is I eat to live...I don't live to eat! We love your recipes and again thanks for sharing!! 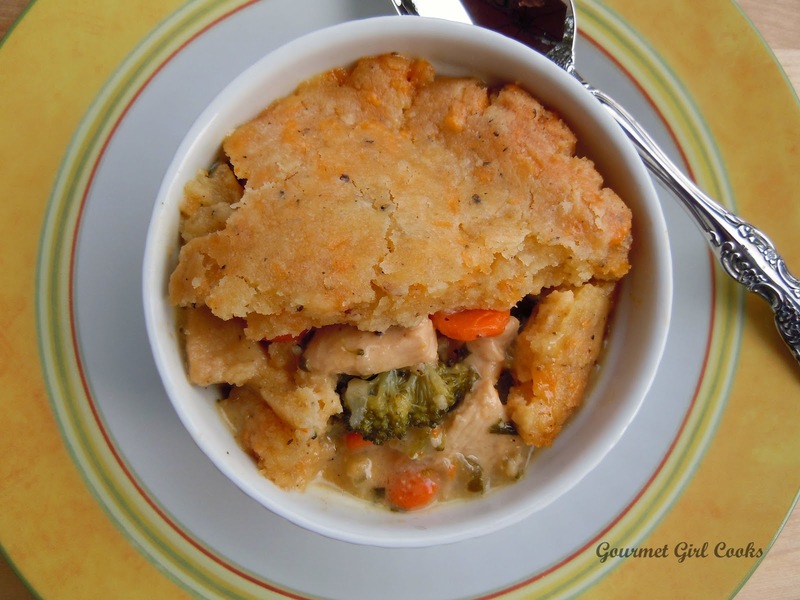 This is the best chicken pot pie we have ever eaten. I make a double batch and it still isn't enough! Today I had a chicken in the crockpot for dinner,so when my husband asked what we would have with it I thought about the roasted vegetables from last night in the fridge. Then, oh my gosh, your lightbulb went off in my head! Chicken pot pie! It was my first time to ever make a chicken pot pie! It was delicious. We loved it. Thank you. 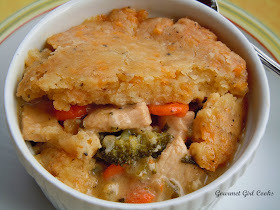 Oh my, this has got to be the best chicken pot pie ever! 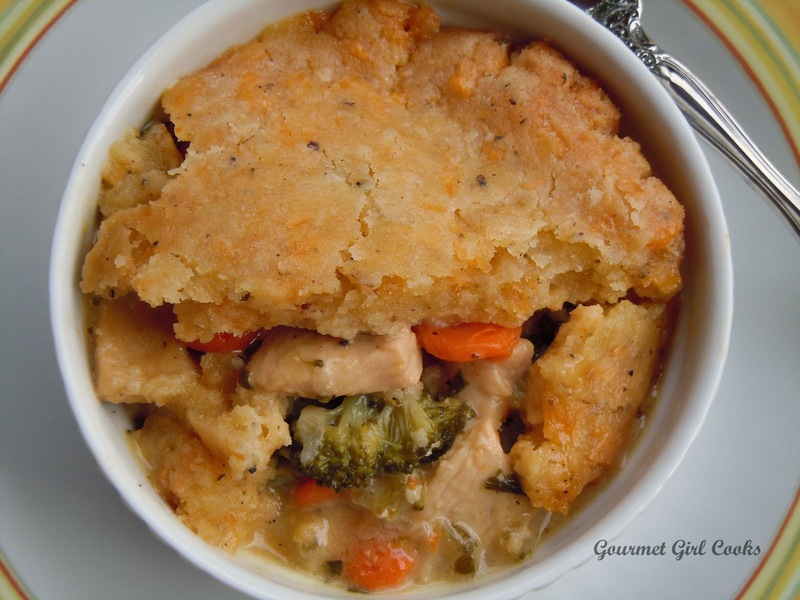 Thanks for sharing this recipe, it will be on the menu for some time to come! I made this a couple of days ago and it was wonderful! Freezing the rolled out crust is such a neat trick. I'd rolled it a little larger than the dish and had no trouble cutting it to size or transferring it. (I used the scraps to make tasty crackers while the pie baked.) I didn't thicken the sauce quite enough with the xanthan gum, though. Having had a couple of previous mishaps with it, I used it *very* sparingly. No matter, though, it was still great and the crust was high enough above the sauce that it didn't get soggy at all. I didn't have cream cheese on hand, so I tried a couple tablespoons of ricotta. Didn't do much to thicken the sauce, though. (I agree with your comment that this recipe would be delicious as a creamy chicken soup!) Next time I will be less "chicken" (hee hee) with the xanthan and/or try the cream cheese. We had the cranberry sauce hot from the stove the first day. I'd simmered it down pretty well, but there was still a little puddle of liquid. It did thicken up a bit more after sitting at room temp and especially after chilling in the fridge. The texture reminded me of how it looked when I used to make it with sugar. The flavor isn't "quite" the same as when made with sugar, but pretty darn close. Perhaps it could be tweaked with a couple of drops of stevia, although we thought it was good as is. BTW, I had a little poached spiced pears in the fridge(they were diced into smallish chunks) that I'd made the day before. I added a little leftover cranberry sauce plus a few pecan pieces to it a couple of days later. The combo was yummy! See how *brave* I'm getting! PS: Don't tell anyone, but I put a dollop of sour cream on top, too! So excited to have found your blog... 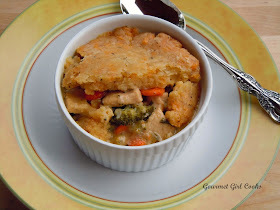 Going wheat-free was a but overwhelming, but loving all the new recipes I've found to try... Especially this one! Also made your Choc. Chip Cookies with Walnuts and Ricotta - one of my favorite wheat-free treats. Thanks for so many wonderful recipes!! I made this wonderful recipe tonight and it was great!! We are just starting "wheat free" in hopes of a healthier lifestyle. My daughter who was just diagnosed with crohns disease is my inspiration to cook differently. I am so very glad to have found your blog. I made this for my family last night and it is fabulous! Hubby even loved it, which always says a lot. :) Thanks again for all your fabulous recipes!!!! I really want to thank you for this recipe. My family kept returning for second and third helpings. Very comforting and delicious! Hi there, this has been on my "to make" list for a long time and I'm kicking myself for waiting so long! Made it tonight and it was easy and beyond delicious! I cheated a little by using frozen diced onions, carrots and peas (my kids love peas, I know they aren't very low carb, but I do it for the kids, ha!). My family and I just love your recipes. I know I can count on you to put only the best out here and I thank you for that!